We all know that Nike will be taking over the NBA’s uniform and merchandising after this season. Nike isn’t new to the NBA. They used to have a deal with them and they have been all over the college basketball scene. But the other week I saw that they are adopting a basketball-cut style jersey for the NFL. A little weird but it makes sense. After all, with Nike going to the NBA, let’s see how they transition back to the pros. They have some experience in it but venturing out into this was a very smart move. 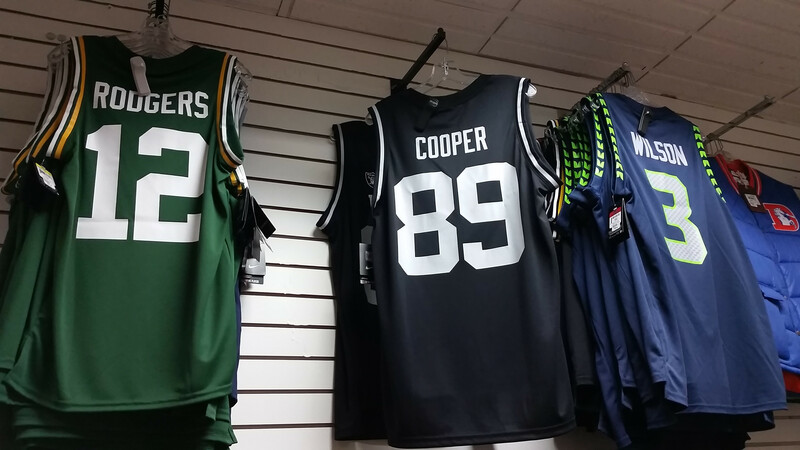 It’s a little odd and I doubt many fans would get a basketball jersey for the NFL. But this helps Nike. They can get a glimpse of the market, test out if they want to use new templates or fabrics. Or in the end, it’s just Nike taking this chance to once again show that they are back on top in the NBA. Either way, it’s a very interesting way for Nike to seek out a small market of basketball jerseys in the NFL. They might learn something new from this and use it for their NBA contract. New Era revealed the sideline caps for this upcoming NFL season. The overall design scheme is simple. It’s the main logo along with a larger logo in the background blending into the crown the cap. From a distance, it is hardly noticeable and looks very similar to the caps the players and coaches had been wearing since Nike took over in 2012. However, if you look at the caps that the teams will be wearing, it will show you what throwbacks you should expect from several teams this year. There are some old throwbacks that were expected to be worn this year. With Stance being the official sock of the NBA, there has been a lot of buzz about the success of this partnership. Now Major League Baseball is joining in on the fun. Keep your eyes open during the All-Star Game. Stance has become the official sock of Major League Baseball. That means, starting with the 2016 All-Star Game, every time you see a pair of socks on an MLB player, it will be a pair of Stance’s new high-quality Fusion Baseball line. The players take care of the game, and we take care of the players. And the fans, too. Stance has already made its appearance in the regular season this year. I don’t think this was a marketing attempt by Stance, but Khris Davis of the Athletics has been wearing Stance socks already this year. We all knew that ad patches will be placed on jerseys throughout the NBA starting with the 2017-18 season. The Philadelphia 76ers decided to reveal that they have a deal with StubHub. And to celebrate that, they got those jerseys and placed them on statues of America’s Founding Fathers. The Sixers have taken off any evidence of them doing this and Uni-Watch was on point with it. And how are fans reacting? Not favorably, as expected. This is pretty exciting for me. Lids and Mitchell & Ness have partnered up to sell these NBA caps. The design, as you see, is solely based on the design of the shorts of the uniform. This is pretty cool as it incorporates a unique element for each team and it’s not some cookie-cutter design. Some of these take us back to when a certain design on the shorts was so unique. Look at the Raptors or Rockets design in the above image. It’s very distinct and I like it. It reminds me of what Reebok did some years back for the NFL. So what’s my only problem? They’re snapbacks. I don’t like snapbacks. I wanted fitted caps. Well, let’s see if I can convince myself to get past that and possibly pick up one of these caps. The Cavaliers are wearing new blue uniforms for opening night. Details here. It actually goes really well with the new court they just unveiled. And the actual uniform isn’t bad. It’s vibrant and it features blue, which the other three uniforms don’t have.